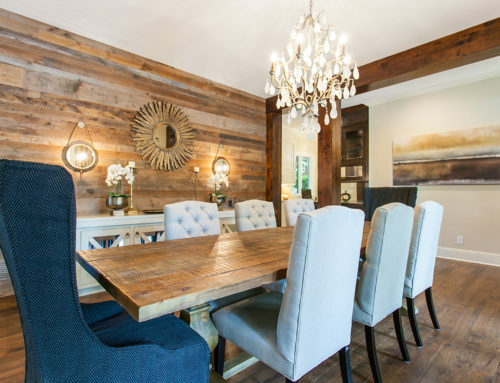 When it comes to creating a home with character that is timeless, classy, and beautiful, wood wall paneling does it best. 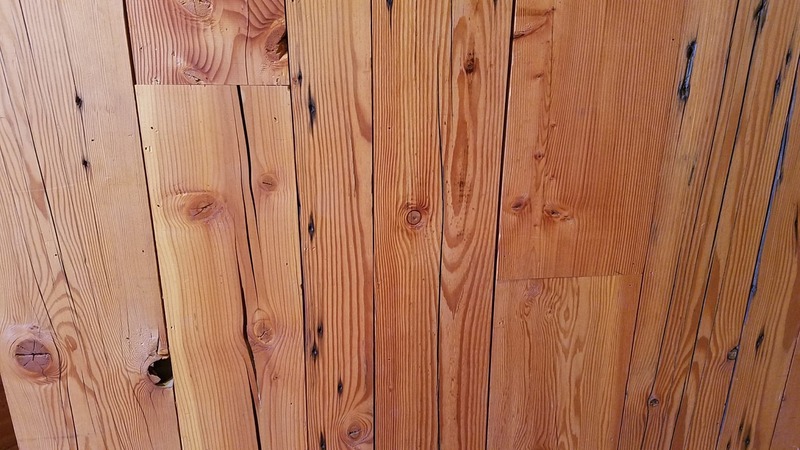 At Manomin Resawn Timbers, we supply gorgeous wood paneling, which is a fantastic alternative to clunky, heavy drywall or toxin-filled paint. 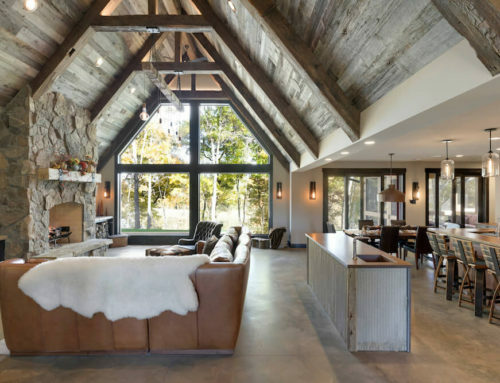 Wood wall paneling is polished, but still provides that rugged and rustic look that you expect with wooden features in your home. 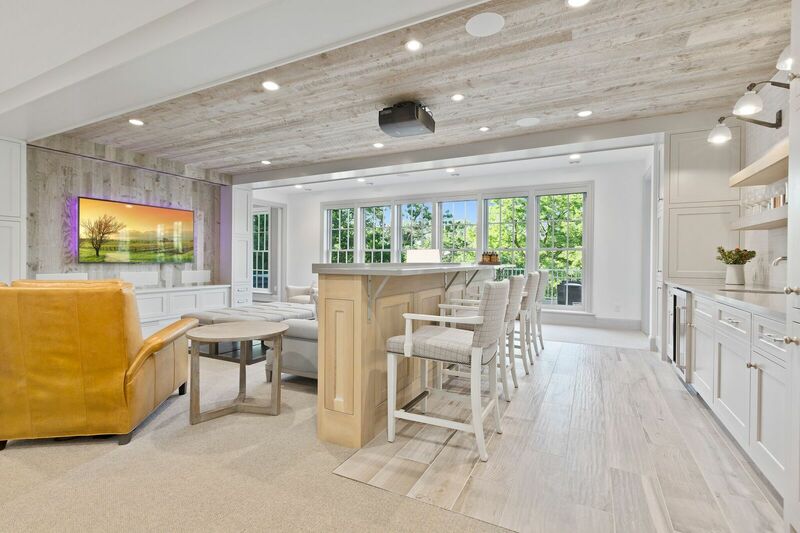 If you’re interested in using wood paneling for your next home build or remodel, then keep reading to learn more about the types of wood you can choose from, their characteristics, and how to implement them into your home! 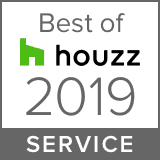 Also, give us a call at (651) 464-1771 to see how we can help with your home building needs. 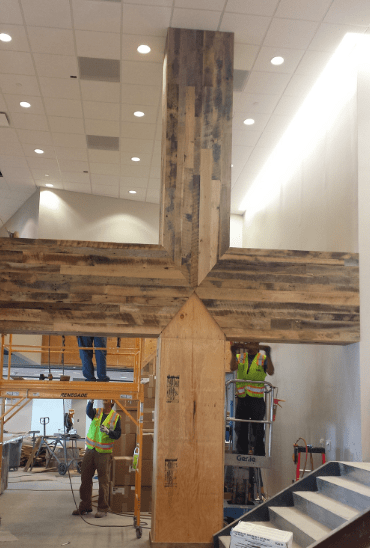 Salvaged from Southern Yellow Pine boards from textile mills in the southern U.S. Weathered antique is a unique type of wood and provides a very rustic look. While not as warm as other darker, browner woods, weathered antique still gives off that cabin-like feeling. White trim looks great with this type of wood paneling, as pictured above. When accenting your home to fit your weathered antique walls, consider using neutral accents. More vibrant colors should be used for darker woods. Another wood that works exceptionally well with neutral colors, platinum gray paneling helps to create bright spaces. As you can see from this example, platinum gray thrives in open-planned homes. Platinum gray can work with more vibrant colors, but they should be kept to a minimum and act more as accents. If you do want to add some more color, a yellow chair or other eye-grabbing centerpiece works well in this space. 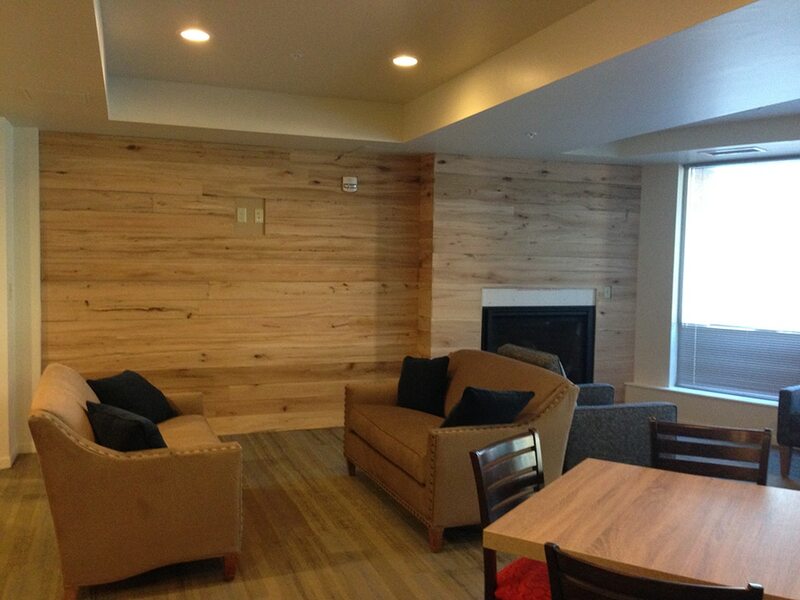 Antique oak wall paneling is a classic style that can help make a home a warm and cozy environment. Darker accents and features around the wall are recommended. 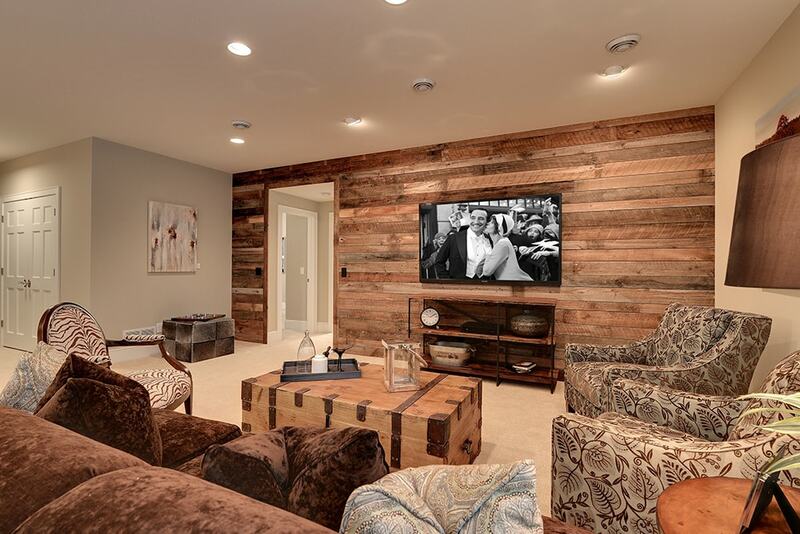 It also looks great in basements to create an inviting atmosphere for hanging out with friends and family. There are few kinds of wood that resemble the color and characteristics of antique ash. If you want your home to stand out from others, antique ash is a great option. While neutral accents can be used in rooms with antique ash, more colorful detailing is suggested to bring out the charm of ash walls. When you look at douglas fir, the first thought that may come to mind is a cabin. 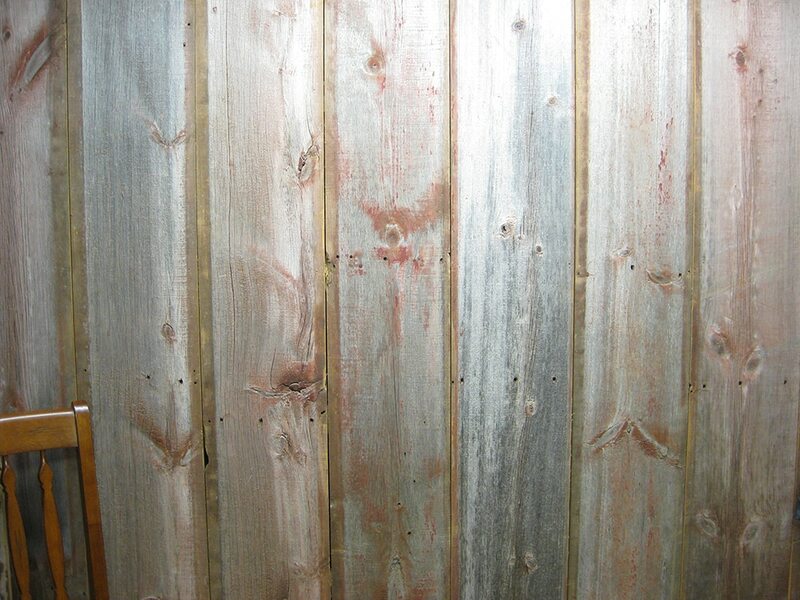 That’s because this type of wood is extremely common for those Northwoods cabins that are so familiar to us. 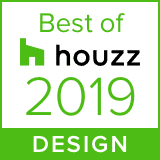 It creates a warm, comforting space and pairs well with just about any accent color Often when Douglas Fir is used; it is the primary material used throughout the interior of a home or cabin. 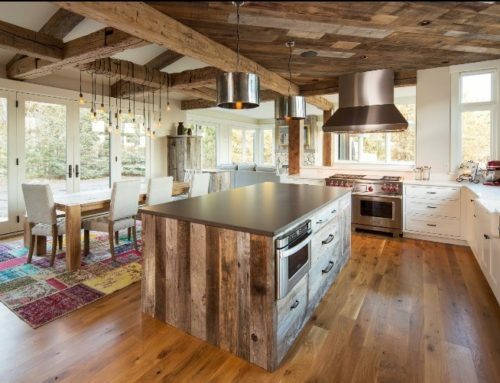 But with all these woods, it’s up to you and your creative preferences in terms of how to accent your walls. Similar to weathered antique, the faded red barn wood is a unique type of wood that you don’t see a whole lot. Red accents work great together with faded red barn wood, as well as dark gray colors. Overall, faded red barn wood can be a bit tricky to decorate around because of its unique mixture of colors. But, if you can pull it off, it looks fantastic. Antique elm is a very common wood to use with modern homes because of its lighter tone, which meshes well in a modern home. Another wood that thrives in open spaces, elm is a gorgeous wood that can be used with multiple different colors and accents. While the room above uses white as a primary accent, gray, blues, and other darker tones can be used as well. 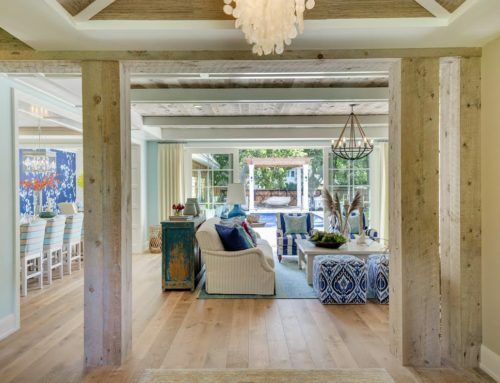 Because of the detailed splash of colors that mixed hardwood provides, it works great as the focal point of the room. Neutral colors should be incorporated into the room to help draw attention to the hardwood walls. 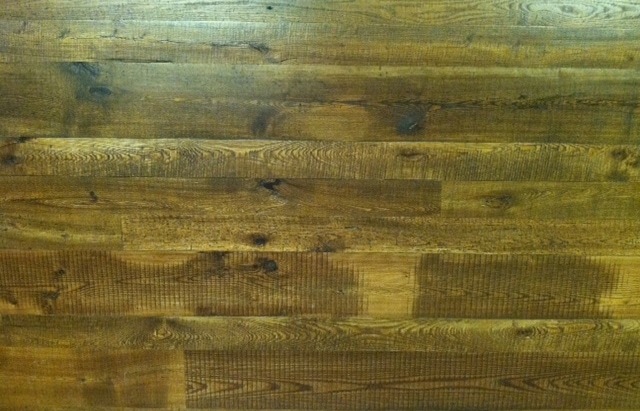 Rustic yet gorgeous to look at, mixed hardwood is a favorite amongst our customers. Wormy chestnut is a very versatile wood, in that it can be used in cabins and cabin-themed homes, as well as in modern homes. It works well when it is accented with darker wood and looks best when accompanied by neutral colors. 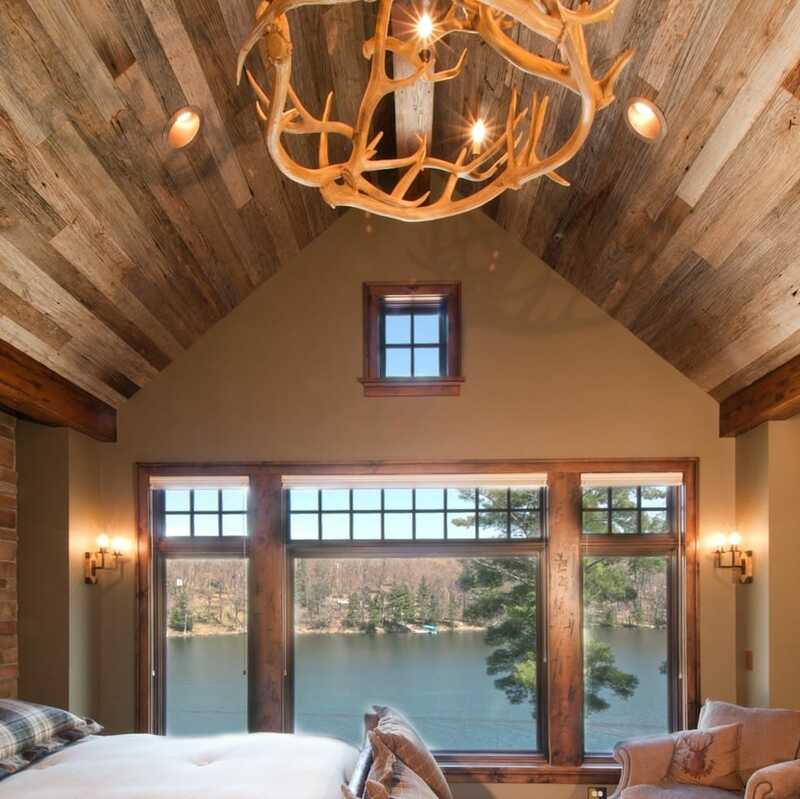 Oh, it also doesn’t hurt to have a stunning lakeshore view in the space too. While this example displays heart pine on a ceiling as opposed to a wall, the style principles remain the same. 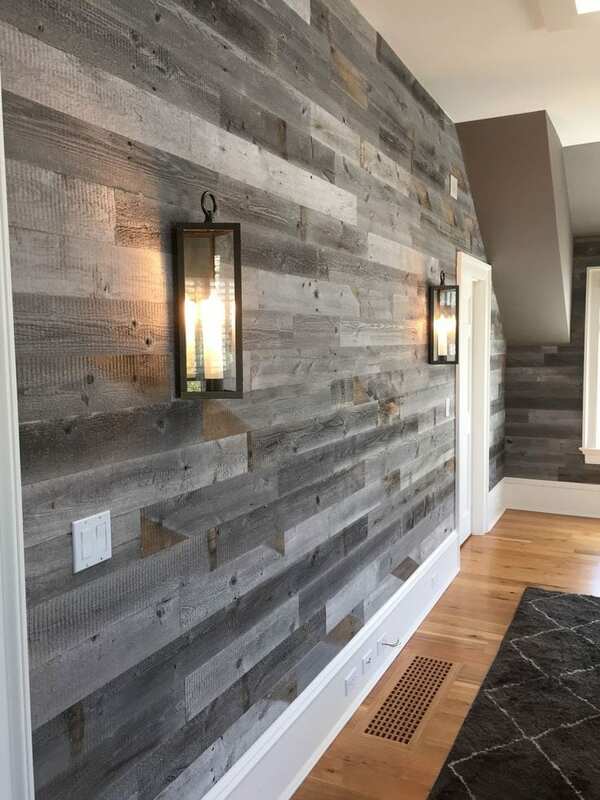 White is a great accent to use with heart pine timber, but just like with the antique elm, blues and grays and other dark tones also work well with this lighter colored wood. Heart pine timbers is another wood often seen in modern homes. If there is one thing you should know about us, it’s that we are obsessed with shou sugi ban wood. 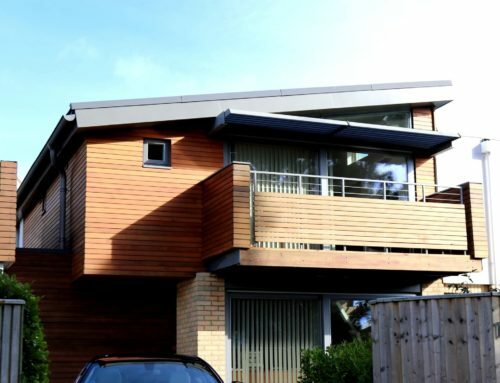 This type of wood creates an incredibly unique home experience and will impress guests for years to come. 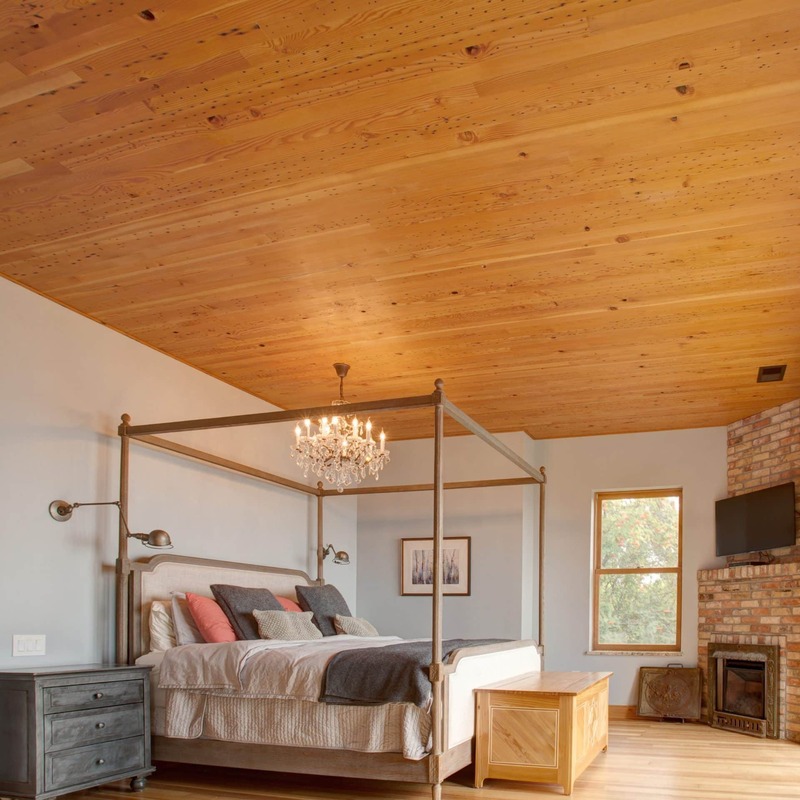 Shou sugi ban works best with other dark colors, but other lighter wood accents can also be used (such as the bed in this example).